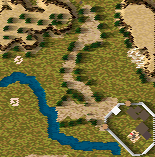 When drawing a river , remember to rotate the map when drawing the ends , or a raw of tiles at the very edge of the map often remains bare land instead of water. Way too easy! I fullfilled the Objectives by Jun 1185 but no win. Far too many resources. You build lots of woodcutters, delete unnecessary walls, sell stone & wood, double rations & buy ale. The first invasion never came although I had about 15 archers waiting.